Are you looking for a stylish and functional way to conveniently access upper shelves or unused space in your library, closet, wine cellar, kitchens, pantries, or lofts? 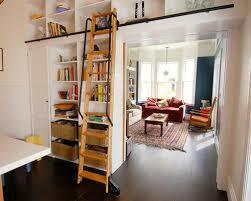 With the Quiet Glide rolling library ladder, now you can. Van Dyke’s Restorers offers the Quiet Glide Rolling Library Ladder wood ladder kits, hardware kits, and rail kits. 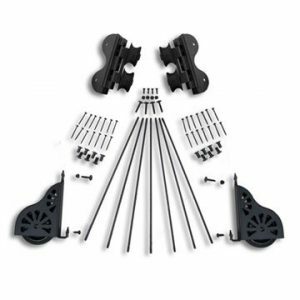 The rolling library ladder hardware kits come in four finishes, three types of upper guides and three styles of ladder wheels. Quiet Glide’s unique ladder rail system is the only library ladder rail kit on the market that offers solid aluminum rails – not hollow tubes. 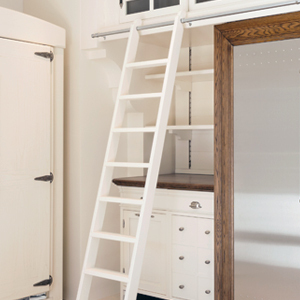 All the parts on a Quiet Glide rolling library ladder are machined or manufactured by American craftsmen. 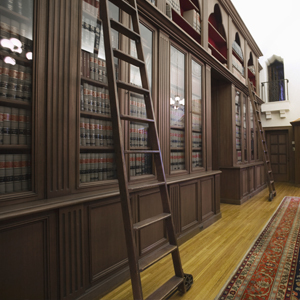 The unassembled library ladder kit contains all the wood parts necessary to assembly a library ladder. Choose cherry, oak, or maple. Hardware is not included. Van Dykes offers two hardware kits – one with brake on lower wheels, and without brake. The aluminum mounting rail is sold separately along with the vertical mounting bracket and horizontal bracket. Watch a video on the Quiet Glide Rolling Ladder by clicking below.